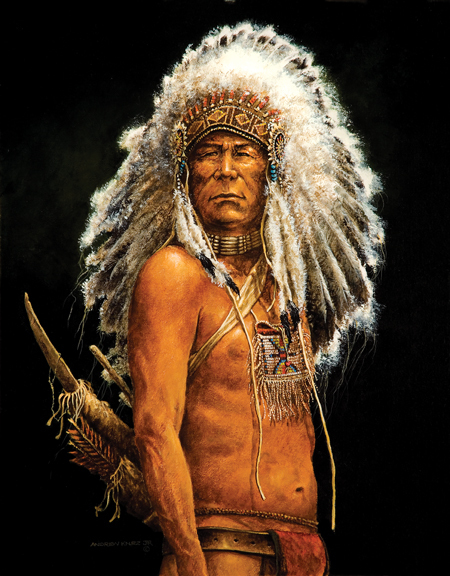 He wears a typical early Sioux style golden eagle feather headdress with quilled forehead band trimmed in ermine pelts. His choker is made of trade hair-pipes and brass beads. His unstrung bow and turkey feather fletched arrows are carried in a common buckskin quiver slung low across his back. The brain-tanned personal pouch hanging from his neck is quilled with a decorative Sioux design and contains small items that have special meaning. Around his waist is a plaited cord. It is usually carried with his personal belongings, but is worn around the waist as a protective charm when he feels he is in danger.